Using the right lamp for your eyes can matter much more than you think, especially if you are always burning the midnight oil. Your eyes need rest, and if you’re going to be using a lamp for studying, that lamp is up close and personal. It may have softer light, but that light is right next to you. What type of lighting do you need for your space? What is a real eye care lamp and why do you need one? Are you a book lover? Is reading your favorite past time? You might want to have your own reading lamp to make your reading much easier. A reading lamp is a device that can be used to lighten or brighten up your workspace. It can be used while you are writing, sketching, doing crafts, and most of all, reading. Choosing the best reading lamp proves to be an important decision. Did you know that they have different functions, features, and design? Are you planning to buy yourself a new lamp? Do you already have an idea on what reading lamp to purchase? Here are some of Amazon’s best-selling reading lamps. It is made from the best materials, making this lamp sturdy. This is an example of an eco-friendly lamp. The body of this reading lamp is made out of a chemical free solid wood. You can safely adjust its cables because they are covered in strong, flexible nylon. If you work on different things besides reading, the lamp can be adjusted to fit your activity. The height and angle of this reading lamp can also be adjusted to help you with other stuff. It is an exceptional reading lamp. It is made up of quality parts and has a good price. Do you have a baby or a pet at home? You do not have to worry that the lamp might fall. It has a heavy base to keep it from falling down your desk. It is very easy to set up, which makes it a really good buy. Another crowd favorite is this Fancii Daylight Magnifying Lamp which comes with a metal clamp. It can also be recharged, making sure that you’ll always have enough light to accompany your reading. This is an energy efficient lamp because of its daylight LEDs. Their brightness can be adjusted in 3 different levels. It is a rechargeable lamp that is designed to have a 6-hour battery life. The magnifying lens of this reading lamp is very great. Powerful 8-diopter optical glass lens with 3x magnification and distortion-free view. It has a three times distortion free magnification, which is good if you have problems with reading smaller texts. You do not have to worry that the lamp might fall down off of your desk. It has a metal clamp that has a solid grip onto your desk. There is also a detachable handle if you want to hold it with your hand. This is one of the most innovative twists on the magnifier light. Different from other’s have just the flexneck and clamp, this one is comes with a handle so you can use it like a traditional magnifying glass. This is a feature-packed floor lamp for reading. It includes an adjustable pole height, premium diffusion film, 5 level dimmable setting, 5 color temperatures as well as a 30-minute timer. This lamp is also one of the best-selling floor lamps on Amazon. You can use it as a floor lamp or a desk lamp. It has 5 lighting options. You can adjust the brightness of this lamp depending on what your lighting mood is. Its LED light is different from other LED lights from other lamps. It releases a big amount of light towards your reading area without even interrupting the areas surrounding you. You do not have to worry about your eyes. This lamp has an anti-glare feature. It is also environmentally friendly because it does not have harmful substances like mercury. Every reader has their own preference when it comes to choosing their lamps for reading. It can be the levels of brightness a lamp has, or even just the design. Just consider the different factors before buying one. Always make sure that the light it emits will be enough to satisfy your reading activity. 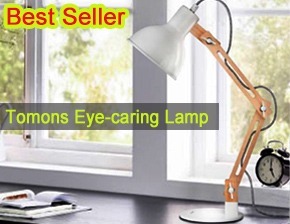 Do You Need A Real Eye Care Lamp For Your Desk? We have actually established why you need one of these lamps, as you don’t want to strain your eyes. Yet you can strain your eyes if you don’t have enough light, too. Are there really lamps designed nowadays that can help light up your space without taking things too far? That is what the best eye care lamp is supposed to be able to do for you. It isn’t just about caring for your eyes though. You want a decorative lamp, and you want one that lasts a long time. Are you getting an LED lamp, or are you going to buy a different kind? There are certainly advantages to each type of lamp, but you have to decide which type you want. It does seem like more people are opting for the modern LED desk lamps. You can also opt for a floor lamp, but those light up a room more, are typically more expensive and don’t necessarily provide focused light over your desk. Desk lamps are also used for more than just desks. If you look at lamps in person at a few stores, there is no way you’re going to be privy to the selection you would be online. Are you going to see what is out there? Not only do you have that selection available to you, but you can also look at ratings for your eyes and what people say about certain lamps compared to others. You may never realize but Pixar Animation Studios mascot, Luxo Jr, is a desk lamp. He is actually a dance lamp. Desk lamps or reading lamps serve as people’s last resort when it comes to working late at night, reading their favorite book, or even finding a relaxing environment in their rooms. More than these benefits, these kinds of lamps transform the desktop look so cool and attractive. For some individuals, these desk lamps tend to reflect their personalities and set their mood. Thus, these things inside the room play an indispensable role in their lives and not only for interior decoration or style only. Best of all, these are things that make the day of those avid readers who usually spend time for this in the evening. Take note that in choose a reading lamp, make sure that it will be a focused lamp especially if you have an existing light source that will illuminate your room space. Great contrast between your surroundings and the material you are reading causes eyestrain. Decide for the lampshade and lamp style that works best for your desktop. You have 3 fundamental designs to choose from: table lamps, wall sconces and floor lamps. All these varieties comes in unique advantages and more specific uses. The wall sconces are more suitable for reading even in your bed. Once you figure out the amount of brightness necessary to the kind of desktop lamp to use, you can proceed to the next step and that is selecting the best lighting type. Today, you have a wide range of selectin for light bulbs that have distinct lumen outputs. For residential uses, incandescent, fluorescent, and LED lights are often preferred. -For incandescent light bulbs, the traditional ones serve as an ideal option when searching for light that works well with the eyes. These bulbs do not flicker since only a filament creates light when heated. These also provide warm-hued consistent glow which is best for focusing or reading. -The LED light bulb types provide the brightest light and illuminates similar to daylight. Thus, all words on the book pages can be easily seen. However, their brightness may cause a little glare if you read books that have glossier pages. -The third type if fluorescent may not be ideal for focusing since they can cause eye strain and headache over a long period of time. Many people choose this light bulb because it is energy efficient. Other features of reading lamp that you can consider include the neck desk lamp and lighting lamps. These types are actually adjustable so you can move them to other directions or heighten them if desired. You may also find magnifier reading lamps which work well for extracting out finest details. Lastly, you can opt for clamp-on task reading lights. These are clamp-based or clip-based lamps that can be attached to other nearby things with the use of a clamp or clip. Bring all these aspects together and you got the right lamp that will not hurt your eyes even when you read for several hours. Do not forget to feed your mind with the essential details about the amount of light that the lamp provides. ♦ Eye-Care, Zero-Radiation, No dark area, No ghosting, No glaring, No harsh to Eyes. This clip on lamp is a versatile and multi-functional light! Great for Music Stands, Pianos, Orchestra Pits, Reading, Work Tables, Mixing Tables, DJ’s, Craft Tables and Much More.Extra Strong Clip Grips Almost Anything or Use it Free Standing.